Gluten free pancake and chiffon cake using rice flour Café. 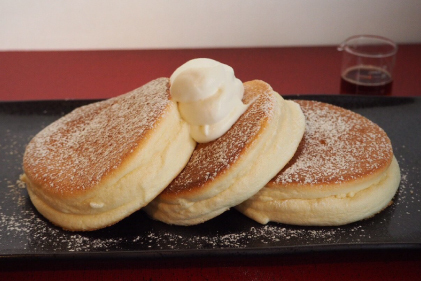 This pancake has surprising new fluffy texture which we could not have done with rice flour until now. We use the best rice flour which is more better than special cultivated rice, Free range eggs purchased from limited farmers, domestic cane sugar, special selected organic soymilk. For take away, we sell brown rice flour cookies, granola cookies and rice flour Pan d'Oro chiffon. Eggs and milk are not been used to all these products.